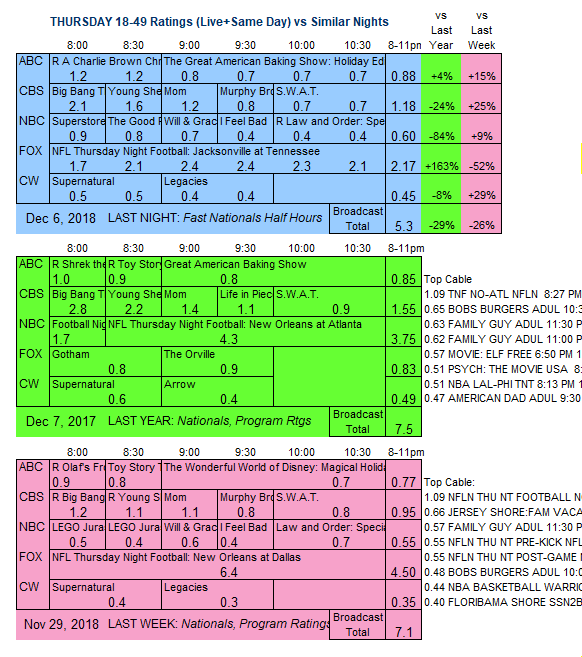 Once again, some shows aired new episodes for the first time in several weeks. 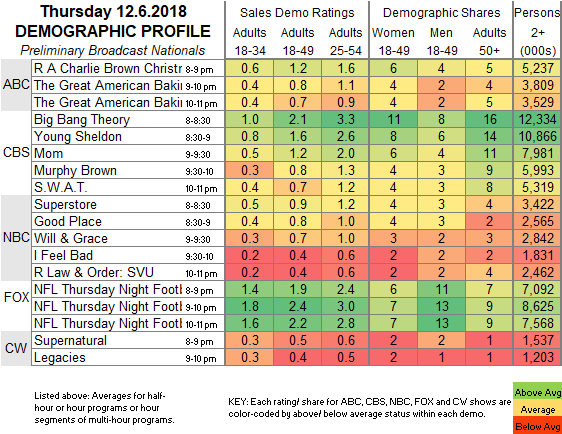 CBS: THE BIG BANG THEORY aired a new episode for the first time since November 15, and dropped 0.2 to 2.1, and YOUNG SHELDON was similarly down 0.2 to 1.6. MOM gained 0.1 from last week to 1.2, and MURPHY BROWN held at 0.8. SWAT was down 0.1 to 0.7. NBC: SUPERSTORE (0.9) and THE GOOD PLACE (0.8) returned steady from their 3-week hiatus. WILL & GRACE rose 0.1 from last week to 0.7, and I FEEL BAD stayed at 0.4. The night ended with 0.4 for an SVU rerun. ABC: A CHARLIE BROWN CHRISTMAS had its first seasonal run of the year at 1.2, down 0.4 from 2017’s initial airing. THE GREAT AMERICAN BAKING SHOW returned at 0.7, down 0.1 from last season’s premiere. CW: Both SUPERNATURAL (0.5) and LEGACIES (0.4) were up 0.1 from last week. FOX: The preliminary 2.2 for THURSDAY NIGHT FOOTBALL was down a huge 2.3 from the early number for last week’s Dallas vs. New Orleans game. Tonight’s midseason finales include CW’s DYNASTY and CRAZY EX-GIRLFRIEND.